Here, available for download, are some of the papers I’ve researched, written, and had published in academic journals or proceedings. Also available are lists of academic/non-academic writing. 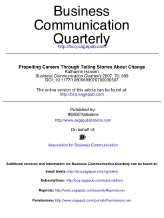 Research interests include organizational storytelling, virtual teams, organizational entry/career development, communication of organizational change, scholarship of teaching and learning, women’s styles of communication, women in leadership and entrepreneurship, and more. 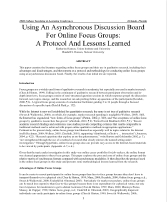 Click here to download PDF of doctoral dissertation. Hansen, Randall S. and Katharine Hansen. (March 2006). Employment Interview Preparation: Assessing the Writing-to-Learn Approach. Developments in Business Simulation and Experiential Learning. Association for Business Simulation and Experiential Learning (ABSEL). Hansen, Katharine (March 2005). 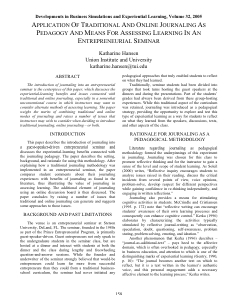 Application of Traditional and Online Journaling as Pedagogy and Means for Assessing Learning in an Entrepreneurial Seminar. Developments in Business Simulation and Experiential Learning.